Vladimir Kramnik spoke to Marina and Sergey Makarychev for over an hour on their Russian YouTube channel about his retirement from chess and plans for the future. 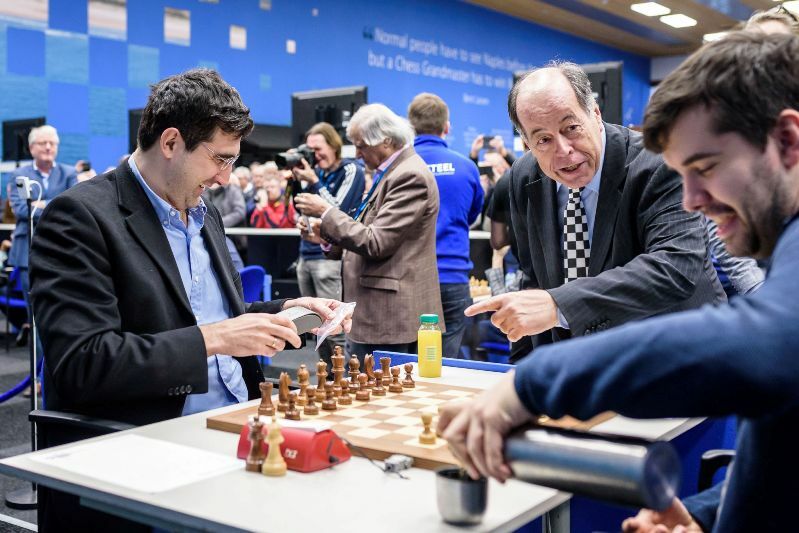 He explained how he felt the moment had come to retire after the Berlin Candidates, when he noticed the outcome of games had ceased to bother him as much as before. His plans now include writing books and the “moral duty” to help develop a new generation of Russian chess talents in the same way as Mikhail Botvinnik and others helped him, while he wouldn’t rule out a rematch with Garry Kasparov. Vladimir. The news of your retirement from chess has rocked the chess world. What’s behind that decision? You’re only 43 years old, which in chess terms is not so much. Couldn’t you still have kept playing and winning for a long time? I never hid the fact that at some point after 40 I’d quit playing. If you read my previous interviews [see e.g. 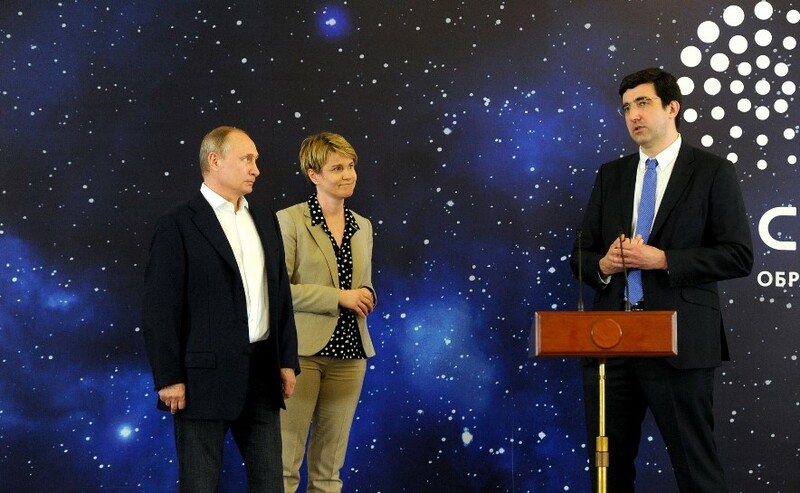 Vladimir Kramnik: “It turns out I’m 52, not 40!”] you’ll see that on more than one occasion I said that if I lose motivation, if I can’t play as interestingly and freshly as before, then… In general, I had the clear feeling after the Candidates Tournament that the moment had come. 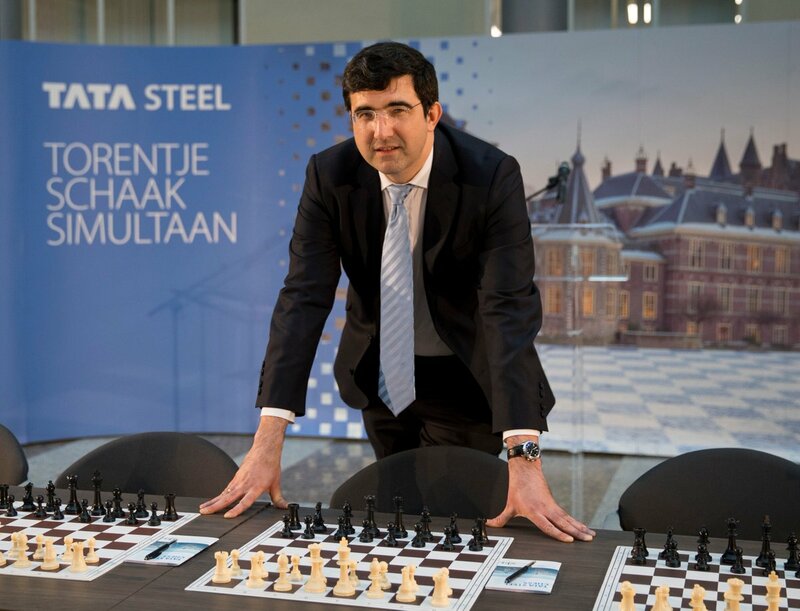 As early as by summer I’d taken the decision to quit, and in the autumn I understood that my farewell appearance would be the tournament in Wijk aan Zee. It was the last contract I’d signed at that moment. 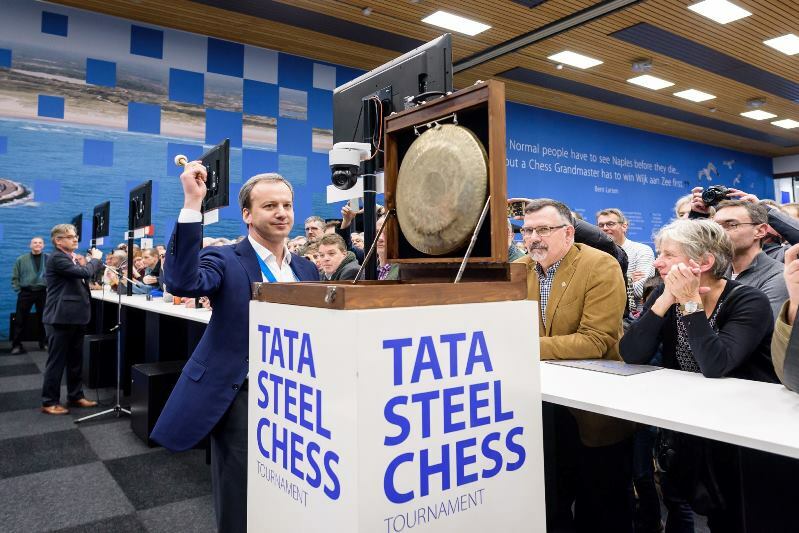 I didn’t want to attract too much attention to myself during the tournament, so I decided to announce my retirement immediately after Wijk aan Zee. On our YouTube channel memes from your fans are circulating: #kramnikreturn, #kramnikthegreatest. What’s the main reason for your retirement? I felt I could no longer give my all. I still, as before, have a real love for chess, but I suddenly began to feel that the result of a game had stopped bothering me as much as it had until only very recently. And with such an attitude, that comes from somewhere within, it’s hard to count on good sporting results. It might seem like an attempt at self-justification, but I arrived in Wijk aan Zee without any thought about the result. I simply wanted to play bold, interesting chess. However, I was surprised to discover that our subconscious has a very strong influence on our consciousness. Because I’d told myself that the tournament would be my last, and the sporting result wasn’t too important, I simply couldn’t manage to concentrate during the games! There was a constant battle between my brain, which just didn’t want to switch on, and the urge nevertheless to force it to strain itself. There were, however, also clear non-chess moments. So in the last round, against Shankland, I could have forced a draw by making the most natural of moves, after which we’d immediately have shaken each other’s hand and gone our separate ways. It was clear at the time that by rejecting that decision I was going to be forced to defend a difficult endgame, but I had the totally irrational desire to extend (even at the cost of probable defeat) my last game even if just by an hour. And I finally grasped that in a certain sense I’d already stopped being a professional chess player, since I’d taken a decision based on considerations that were very far from sport. I’d nevertheless always played with total dedication. 50.Bxa6! would have been the logical way for Kramnik to end his career with a draw against Sam Shankland. Instead he went for 50.Ba2? By the way, something similar happened a few days before that as well in the game against Anand. 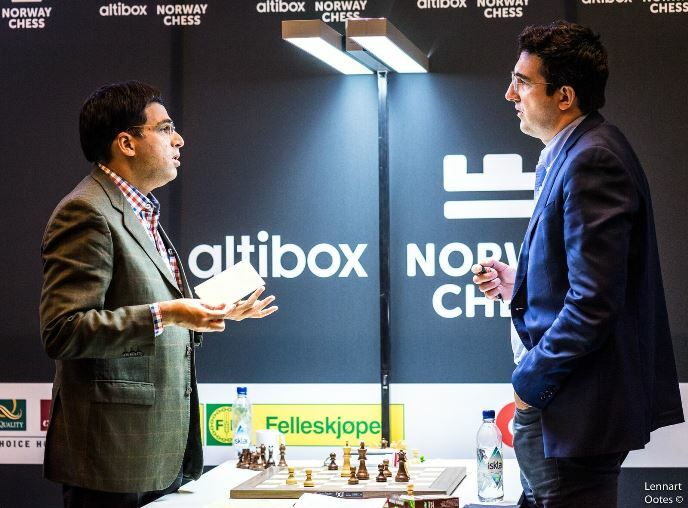 Vishy played the opening very well with Black and, instead of simply bringing the struggle to an end and fixing a dull draw, I made a totally crazy move while understanding perfectly well that after it I’d have a bad position. Life after life… What are you planning to do after retiring from chess? After all, it’s unlikely you’ll be able to rest for long? Yes, at first I wanted to rest, but somehow life doesn’t allow it. I’m curious to see what comes of my projects, since I’ve been playing chess since I was five. The life of a chess professional is very specific! You’re always thinking about the game and you find yourself under constant pressure: after all, a tournament’s always starting soon. You need to prepare and get into good sporting form. I’ll probably miss the adrenaline you get from playing, but I’m not afraid of this new stage. Of course I don’t know how it will work out, and it’s unlikely it’ll be more successful than the chess one, but I’m interested in trying it out. I’ve got a lot of projects. After all, I’m a social person and I’ve built up a lot of links with interesting people who I can implement those projects with. One of them is a global children’s project. I suspect that the world is going to change a great deal in 10-20 years, and we need to prepare a new generation of children, to instill in them flexibility of thought and the ability to apply your knowledge in various spheres of activity. After all, we’ve got no idea what professions will remain and be suitable for our children in the future, so the ability to react fast to changes in the surrounding environment will become a trump card, the main competitive advantage for young people. I’d like to develop those skills in the upcoming generation through chess, but not only through chess. I also have an idea about helping talented kids from 17 to 20 years old, who are at the age when they’re graduating from the chess section of Sirius, and preparing them to be elite chess players. I feel that I could work seriously on that: I’ve got vast experience and vast professional knowledge. Yes, chess remains popular in our country, but objectively speaking in the last ten years the only new elite chess players who have made it into the Top 10 are Nepomniachtchi and Karjakin. You can’t help but be worried about that. I have plans to train a top player, who in time could become World Champion. I wouldn’t rule out such a possibility – it’s interesting and a challenge. There are a few more projects not connected to chess so, as you can see, I’m not going to be idle - that’s one thing you can be sure of. Have you thought about writing a chess book or memoirs? Both of those are possible, but I’ll definitely write a purely chess book. Many fans and even professionals have begged me to write one or two chess books. Many like my commentary and how I talk about chess. I think I’ll also work on that. Back then in 2000 the chess world was eager to see a new match, a rematch against Garry Kasparov… Did you ever regret that the match never took place? Many people still don’t know about it, but the question wasn’t only or so much whether I wanted or was ready to play a rematch against Kasparov. I’d very gladly have played that match and, by the way, I did a lot for it to take place, but when I became World Champion I considered it my duty to establish a stable World Championship cycle, the lack of which was something almost all the top players of the late 90s had suffered badly from. Yes, I was very lucky personally that I managed to play Garry Kasparov, but in the system that he himself developed (together with Braingames), there was no point about a rematch! Besides, Garry himself insisted on excluding such a point since rematches contradicted the whole spirit of the system he established, according to which the loser of the London match would start the next cycle in the Candidates Tournament. If you’re talking personally about me, then in order to play a rematch I would have unilaterally had to rip up the contract I’d signed. I conducted a lot of consultations with the main organiser from Braingames, who was ready to tempt Kasparov by significantly increasing the prize fund of the Candidates cycle but, alas, Garry wanted to play against me bypassing any kind of qualification. I’m convinced that he made a big mistake back then, since it’s almost certain that Garry would not only have qualified for a match against me but would thereby also have fully legitimised the new World Championship cycle. And is it possible that now, having retired from chess, you can play a retro-match in (using his terminology) “the World Champion retirees club”? I’d happily play such a match, since I haven’t quit chess in general but just professional chess. In other words, I wouldn’t reject playing in some friendly exhibition matches – rapid or blitz matches that interest the public. Playing against Garry – in any format and with any time control – would be extremely interesting for me. After all, Kasparov is the greatest of chess players, and if someone offers I’d be extremely happy to face him. By the way, and off topic, I can say that in 2005 I almost played a match… with Fischer. We held negotiations on a match in Fischer Random chess – he proposed it himself. My friend Joël Lautier flew to Iceland and held two days of talks with Fischer. As Joël told me on his return, Fischer would agree and then again start to have doubts. In the end nothing came of it. A huge pity! At the start of the 2000s, when I became World Champion, and chess found itself at its lowest ebb, I was essentially alone against everyone. FIDE really didn’t like that there was some champion independent of them, but I’m very glad that I’ve made a contribution to the chess world in its current state, with a clear World Championship cycle. After all, I lost my title to Anand when things had already normalised. Vishy also made a big contribution to raising respect for chess. He did it constantly with his decency, openness and nobility. As a result chess rose to a new level, there were no more big scandals, and there are incomparably more good tournaments around the world. By the way, I really like what’s happening just now in the chess world. There have been positive changes: Arkady Dvorkovich was elected FIDE President. I can see how the whole chess world is rallying around him – both the players and organisers. Chess forces are being consolidated. Anand, and myself, and Judit Polgar. Carlsen has spoken very positively about FIDE. I think that together we’ll work at raising chess to a new level. Vladimir, how would you evaluate the presidency of Kirsan Ilyumzhinov, that’s now come to an end? Overall I evaluate it positively. Yes, there were mistakes, yes, a lot of things could have been done a lot better, but in any case an awful lot of good was done. As for his team, and Makropoulos in particular – there I have serious questions. I respect what was done. From the outside it might seem as though: become president and do what you want, but after all, you constantly have to look for sponsors, find money, settle conflicts, iron everything out, for example, during my reunification match against Topalov. I think we should express gratitude for Ilyumzhinov, for all the pluses and minuses. The man did what he could – and now we find ourselves at a relatively decent level, especially if you compare it to 1995, when he came along. That’s probably to his credit.